On January 25, 2016, we were all deeply saddened by the sudden death of our Prior Provincial, Father Joseph J. Gallardo, OAR, due to a heart attack, in West Orange, New Jersey. Father Joseph was born on February 12, 1959 in Los Angeles, California. He entered the Novitiate of the Order of Augustinian Recollects in Navarra, Spain, on August 28, 1989. He made his simple profession on September 1, 1990 in Navarra, Spain; Solemn Profession in Suffern, New York, on August 28, 1993. He was ordained a priest in Santa Ana, California, on October 1, 1994. He served as a priest in various parishes in the Archdiocese of Los Angeles, and in 2009, he was elected as the Prior Provincial of Saint Augustine Province, Order of Augustinian Recollects, a position he held until his sudden death on January 25, 2016, in West Orange, New Jersey. May you rest in peace, Father Joseph! We rejoice with Brother Anthony J. Torretti, OAR, as he celebrates his 50th anniversary of religious profession in the Order of Augustinian Recollects. A native of Philadelphia, Pennsylvania, Brother Anthony entered Tagaste Monastery in Suffern, New York, as a postulant in 1963. A year later, he was transferred to the Monastery of St. Augustine in Kansas City, Kansas, to continue his religious formation as a novice. He professed his religious vows there on April 22, 1965, and on the same date in 1968, professed his Solemn Vows in our religious community. He continued his education at Donnelly College in Kansas City while serving as local procurator for the monastery community. He completed his studies at Rockhurst University in Kansas City, Missouri, with a degree in Accounting. Following graduation, he was assigned to teach Accounting and Economics at Donnelly College where he served as the Director of Financial Aid until his assignment to the East Coast in 1974. Throughout the years, Brother Anthony has served our religious community in a variety of administrative positions as well as parochial ministries. His financial expertise and attention to detail have been recognized by our province leadership, and he has served as Provincial Procurator, as member of our Provincial Council and Director of the Office of Development, as well as President and longtime member of the Secretariat of Finance for the Province of Saint Augustine. He has served as local Procurator in most of his assignments in the United States and at the General Curia in Rome. In addition to responsibilities within the local community to which he was assigned, Br. Anthony enjoyed parochial ministry at Sacred Heart School in Topeka, Kansas, where he taught religion and advanced mathematics at the junior-high level. He had served as Business Manager of St. Augustine Parish in Newark, New Jersey, and also at Saint Benedict Parish and School in Montebello, California. Throughout these fifty years as a professed member of our religious community, Brother Anthony has taught us by his example the importance of being faithful to what we profess and in sharing his time and talents. His longest assignment was at the Provincial Residence in West Orange, New Jersey, where he served our community for over twenty-four years. For the past year he has been assigned to St. Augustine Priory, Oxnard, California, continuing to be generous in his service to the community. Happy 50th Anniversary, Brother Anthony! Dear brothers, God is love and to participate in his love is no small thing. Time is needed to meditate, time to listen and time for silence and internal peace. Listening isn’t hearing that one calling, responding to the vocation; it is listening every day, committing to growing closer to the Lord, personally growing in God’s love. I am Father Jorge Mateos-Perez, OAR, ordained four months ago, and my priestly ministry is as parochial vicar at the parish of Our Lady of Guadalupe in Santa Ana, California. My vocational history begins in my childhood as I discovered the grace of God through the help and guidance of my family. My years as a seminarian were quite formative for me. They were years of joy, discovery, friendship, prayer and reflecting, but mainly time to revel in the feeling of being invited and called by God. I don’t mean to say that this was an easy time. I would be lying to say it was all rose-colored. Nonetheless, the tests always served as great challenges to keep going. There were moments of uncertainty, heartache, and doubts, but throughout, Jesus was always present. While at the seminary I learned that God provides just what we need in the moment, and that to hear him one must be silent, especially in that great quiet of night. I also learned that God is present in the simplest aspects of daily living, and that following him is the greatest adventure I could undertake in my life. Before I was in the seminary, when I was asked if I could imagine myself becoming a priest, the answer was no. Moreover, even once in the seminary, I still hadn’t envisioned myself as a priest until the last years, when in the midst of a crisis, I discovered that the vocation of priesthood is a call to participate in an adventure with my Lord, a call to the complete abandonment of misery, and that I am not who I chose to be, but rather who He has already chosen, humbled, to follow him. My heart was hesitant, responding to the call: Why not? If you want me to do this, then this is also what I want. Ever since that moment, things have been different. My experience of being ordained as a priest has been and continues to be, the greatest blessing that I have received in my life. I plead daily to be able to carry out God’s work, with the aid of prayer and the grace of God. Only God can call us to a vocation where the mission is greater than our own strength and human capacity. Only with Him, and in his graces, can we persevere day in and day out, carrying out his works. So now when I feel the enormity of the demands and my own and many weaknesses, I humbly ask for His help (We carry the treasure in clay vessels. 2 Cor. 4, 7), recalling that nothing is impossible when I render my heart, mind, and my will completely to the priestly ministry for God. My first act as a priest was to give communion to my parents, in thankfulness for having given me life, and so I gave them the Eucharist, the Body of Christ, the bread of life. At this time, my hope is always in the goodness of God; if he has chosen me, it’s because he wants me to live for others. To be a priest means to be of God, and God is for all, and hence a priest must be for all, the village of God and for all in the village of God. January 18, 2015 – Commissioning ceremony of altar servers, lectors and Eucharistic ministers. Saint Benedict Parish commissioned the new altar servers, lectors and Eucharistic ministers to serve at the table of the Lord. A good number of faithful answered the call to serve and were commissioned by Father Francisco Sandoval, OAR, at the 10:30 AM Mass. February 7- World Marriage Day Dance. World Marriage Day was celebrated with a special blessing in the masses of the day but here at St. Benedict we went a step further and celebrated it with a dance where a large number of couples gathered to dance on Saturday evening. February 18 – Ash Wednesday – Saint Benedict Church started the Lenten Season with the Ash Wednesday imposition of the ashes throughout the day. The faithful began the holy time of Lent with eagerness and with hope as they had their sights in the Easter Sunday Glory. February 21 – Casino Night. The Saint Benedict School hosted Casino Night as a fundraiser and once again it was very successful, and it was an opportunity for the school parents and parishioners to mingle and enjoy a time together while at the same time they helped their school. The Commerce City Casino came to our hall and set up the many poker tables where the people played and enjoyed a good atmosphere until 11:00PM. March 21-22- St. Joseph’s Table. The Italian Confraternity hosted the Saint Joseph’s Table in the Hall both Saturday and Sunday by giving away free pasta and in turn the people turned into shoppers of delicious Italian pastries and plants for the benefit of the Italian Co-fraternity. Lenten Missions: The parishioners of St. Benedict had the opportunity to get ready for the Holy Days by attending an English and a Spanish Lenten mission from Sunday March 22-26. Father Bill Adams gave the English mission and our very own Father Jorge Alberto Niño, OAR, gave the Spanish mission. Parishioners enjoyed the talks which ended with confessions on the last day of the mission talks. Holy Week once more was a very special occasion at St. Benedict as the groups came together on Good Friday and put together the live Stations of the Cross. The faithful were deeply moved by their acting and everyone had a very meaningful and spiritual evening in preparation for Easter Sunday. Marking the Year of Consecrated Life. Fathers Michael Rafferty, John Gruben, and John Oldfield attended a celebration of the Year of Consecrated Life sponsored by the Sister Servants of Mary Immaculate on February 8 at St. Mary’s Villa in Sloatsburg, New York. The day consisted of Mass celebrated by Eastern-rite Bishop Paul Chomnycky of Stamford, Connecticut, lunch, a tour of the Villa, and various vocational testimonies given by the sisters. The Tagaste Guild hosted its annual St. Patrick’s dinner dance fund raiser on March 7; about 120 people were in attendance. All enjoyed the traditional corned beef, cabbage, potatoes, carrots, and soda bread; cookies, coffee, and tea for dessert. There was a 50/50 and there were several generous donations to the Guild fund. Joe Nappo, Tagaste DJ, provided the music. The day, as usual, was a financial success. 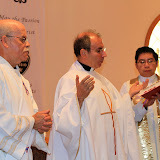 That same day the community rejoiced “from a distance” with Deacon Jorge Mateos who was ordained to the priesthood at Our Lady of Lourdes Parish in Mexico City; he had been a member of the Tagaste formation community for some 9 years. Congratulations, Father Mateos! The annual regional SAR day of recollection was once again hosted by Tagaste Monastery on March 14. Father Oldfield coordinated the day with the help of SAR president, Joseph Marsico. Fathers Gruben and Charles Huse gave presentations, respectively, on the Year of Consecrated Life, and on the importance of renewal and spiritual growth for the SAR vocation. Father Fredric Abiera led the Stations of the Cross; Father Oldfield celebrated the closing Mass and Father Rafferty gave the homily. Afterward a dinner along with the traditional blessing of the St. Joseph table was held in the Guild Hall. Some fifty SARs were present, representing the West Orange and Tagaste fraternities; they braved rainy but relatively mild weather to be present. The day opened with registration at 12:30 PM and concluded with dinner at 5:30 PM. On a sad note, former secretary for the community of West Orange and SAR member, Regina Zielinski, fell in the guild hall and broke her hip. She was taken immediately to Good Samaritan Hospital in Suffern where she underwent surgery the following day. Two days later she was transferred to a nursing home close to her son in Newton, New Jersey. Our prayers for Regina’s speedy recovery! Father John Oldfield honored. The July-December, 2014 (LIX, 234-35) issue of Augustinus (AVGVSTINVS) was dedicated to Father Oldfield, who served as director of the Augustinian Recollect journal from 1997-2006. Father Enrique Eguiarte, OAR, the current director of Augustinus, wrote the dedicatory article in which he praised his predecessor and personal friend Father Oldfield, most especially for establishing stronger ties between the OAR journal and scholarly publications and academic institutions in the United States and England.